We haven’t had the chance to tow test Volkswagen’s large SUV since the last of the first-generation (facelift) Touareg V6 TDIs back in 2007, so we were keen to see how well this new, second-gen update model performed as a 3500kg tow hauler. 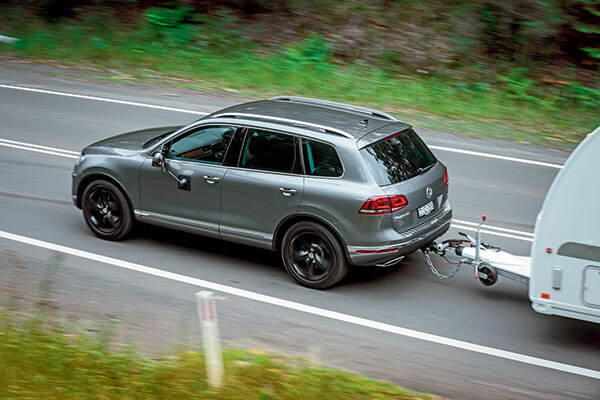 The Touareg might be a bit-player in the Australian passenger vehicle market but, anecdotally, there appears to be quite a few on the road being used as heavy-duty tow vehicles. Back in 2008, we thought that the Touareg did a great job of hauling a heavy van, but would this new generation keep to the tradition? Unfortunately, there has been a change to press-vehicle policy since we last tested a Touareg. As with the Amarok V6 we tested last month (CW561), we could only test a Touareg with factory-approved accessories fitted – this is the Volkswagen edict globally for its press evaluation vehicles. So, one Volkswagen-approved 3500kg towbar? No problem. An electric brake controller? Er, no, that’s a problem – none exists within the Volkswagen Group Australia accessory catalogue. That meant we were restricted to towing a van with override brakes – hence, the 1700kg Adria you see on these pages. We tested the Touareg V6 TDI Wolfsburg Edition, which is $7000 more than the V6 TDI on which it is based. The Wolfsburg features over the V6 TDI include diamond-stitched Nappa leather trim, heated/ventilated front seats, dark wood veneer inserts, heated steering wheel, ambient lighting, black 20in Mallory alloy wheels, rear spoiler and dark tinted LED taillights. 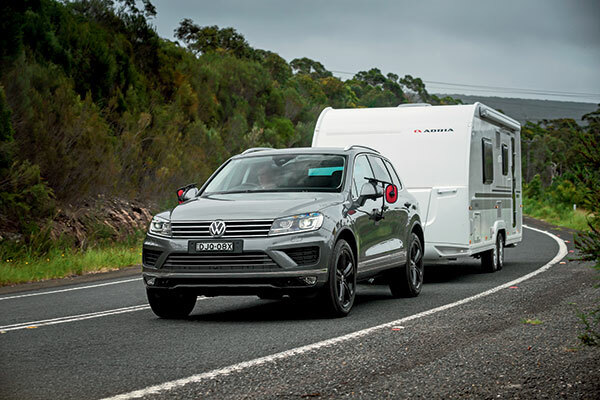 The Wolfsburg Edition is $88,990 (plus on-road costs) and with the $1500 metallic paint option (Canyon Grey) and towbar kit ($1535 plus fitting), the as-tested price was $92,025 (plus towbar kit fitting costs and plus on-road costs). 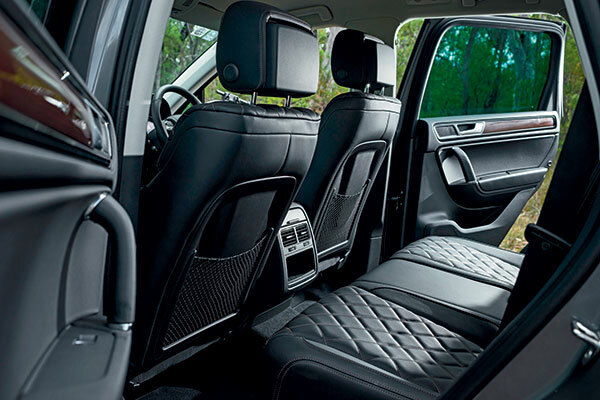 The Touareg’s cabin is understated but is well put-together and shouts good quality. Seats provide good support and are comfortable – although getting into the driver’s seat (if you’re on the shorter side) involves a bit of neck-bending to negotiate the swept-back A-pillar. While the Touareg is a constant 4WD, Volkswagen deleted the offroad pack as part of its 2015 update – so the dual-range transmission is no longer available. The 3L turbodiesel V6 is the same as is used in Porsche and Audi SUVs and is getting a bit long in the tooth. You wouldn’t know to drive it, though; with this long-stroke V6 punching out 180kW and 550Nm it has plenty of get-up-and-go. 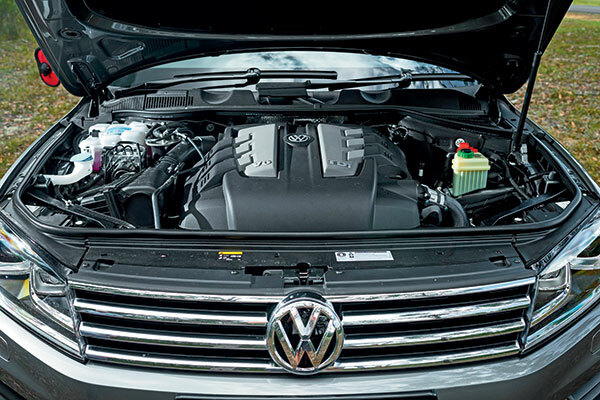 Unlike the Amarok V6 (which has an overboost facility to increase power from 160kW to 180kW for short periods), the Touareg gets all its 180kW whenever you need it. Unlike the Amarok, this V6 has very little turbo lag; it responds quickly to throttle input at low revs. From thereon in, it has a strong mid-range and if required a smooth and quick transition to peak revs. 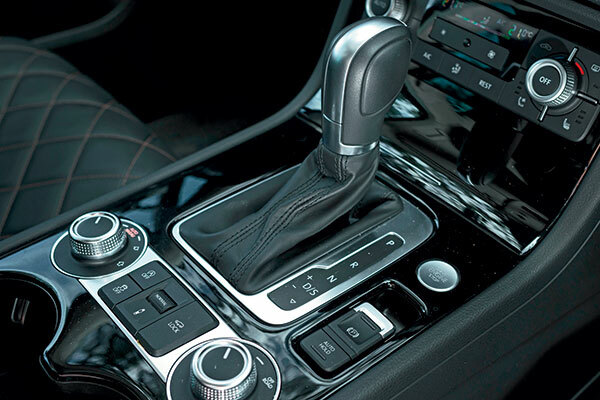 In Drive, under full throttle, the eight-speed auto shifts to the next ratio once the tacho hits 4000rpm, although it can be encouraged to reach close to the 5000rpm redline in Sport mode. There’s really no point revving it hard (despite how smooth it is), as peak power arrives between 4000-4400rpm. That’s all well and good to know if you need all the Touareg has to offer right here and right now, but what about day-to-day cruising? In such conditions, there are no vices and the auto shifts imperceptibly between ratios and with the lack of turbo lag, it has a crisp throttle response at any revs. It’s a competent and refined mechanical package. 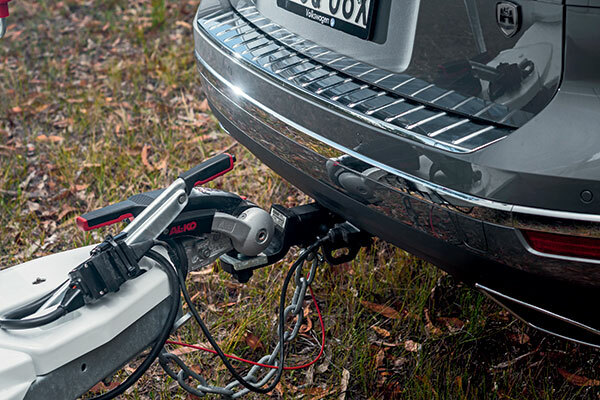 While towing a 1700kg tandem-axle caravan, the Touareg averaged 15.8L/100km. While driving solo in mostly urban running, the Touareg achieved 11.8L/100km. A bonus for touring is the Touareg’s fuel capacity: it’s a generous 100L. 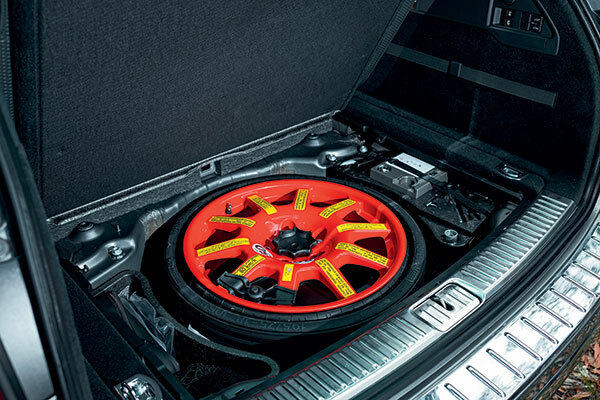 The Touareg took on the 1700kg van without much complaint, which is hardly surprising. Driving up steep freeway hills is always a good test of a tow tug regardless and, here, the Touareg showed it would likely shoulder a heavier van with ease. Not only did the Touareg maintain speed up the steep climbs on the F3 north of Wollongong, NSW, it would easily increase speed while motoring up them. Engine braking was acceptable rather than stellar; being so smooth and keen to rev when accelerating doesn’t help the 3L V6 when using compression braking. There was some slight sway when towing at 100km/h, but with only 80kg towball download with an unladen caravan, it’s no surprise. 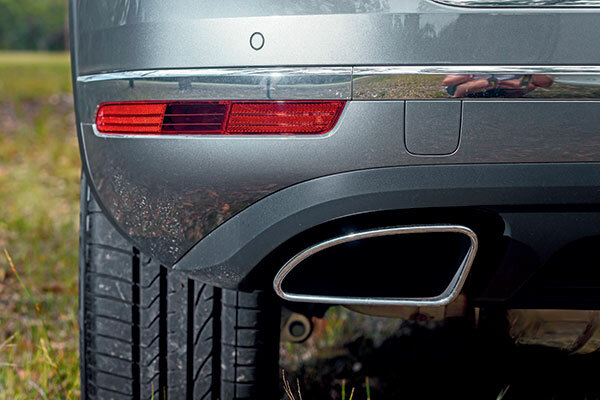 With more weight on the ball, the Touareg would no doubt feel more planted. Its long wheelbase and relatively short rear axle-to-towball measurement are promising signs for good towing stability. It’s true that not everyone uses the same style of towing mirrors, but if you’re using the type that attaches to the side mirrors as we were, you’ll find that the Touareg’s oddly shaped mirrors don’t make it easy. It takes a fair bit of effort to secure them so that they don’t slide down the steep angle of the mirror shells. 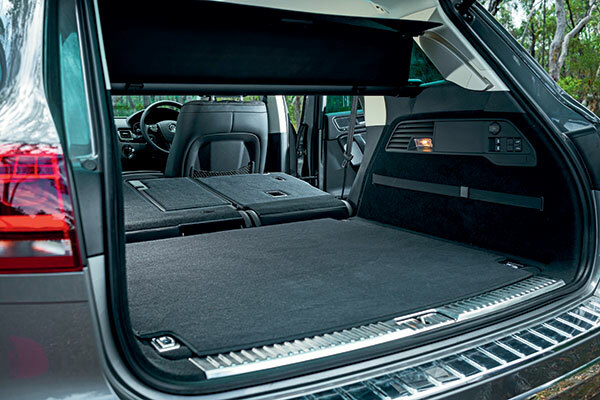 It’s worth noting that while the Touareg has a 3500kg maximum towing capacity, its towball download is limited to 280kg. That’s still an ample amount for all but a few caravans. There’s plenty to like about the Volkswagen Touareg as a towing platform, with its performance and good fuel economy among the highlights. It would be interesting to hear from Touareg owners who tow heavy vans, because there are all the signs that this vehicle would handle at least 2500kg behind with ease; it’s just a shame we weren’t able to test that. Thanks to Carlon Caravans, 105-107 Princes Highway, Unanderra NSW, (02) 4272 6000, for the loan of the caravan for this test. The full tow test appears in Caravan World #562. Subscribe today for the latest caravan reviews and news every month!